When prison spaces are designed to foster personal change and hope, they are more likely to reduce re-offending and prison violence. Over the last 2 years we have been exploring new ways to use our painting and decorating expertise to enhance spaces within the prisons. Our project ““Improving the Prison Environment” was initially piloted in HMP High Down has been recently repeated in HMP Brixton to brighten up the visitors area. The projects are co-created with the prisoners and an artist together developing themes and informative illustrations that the prisoners would value. In Brixton the creative for the main Visitor’s Area took inspiration from our association with the Royal Astronomical Society with whom we are running astronomy and STEM education alongside our core curriculum. 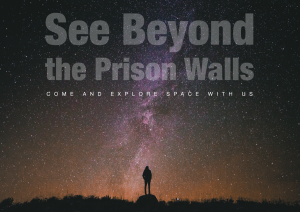 Our programme “See beyond the Prison Wall” brings the study of astronomy and the wider universe to prisoners to help them to explore their place in the universe, see beyond their current circumstances and start to think outside the prison walls. With the guidance and direction of Fellows including two acclaimed astronomers : Andreu Font-Ribera (Lecturer in Cosmology at UCL and Ernest Rutherford Fellow) and Tom Kitching (Reader in Astrophysics at UCLs Mullard Space Science Lab and Fellow of the Royal Astronomical Society) Federica created an amazing “Astronomical Wall” featuring Galaxies and Skies. 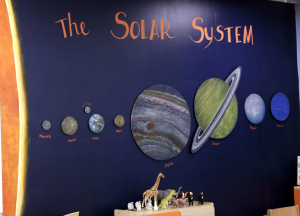 The dark blue Galaxy wall transitions to a light blue engaging, interactive solar system in the children’s area where children can move the elements around and learn about the sky. 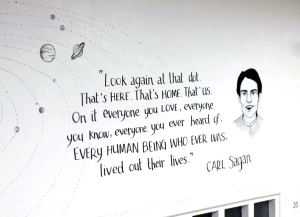 Additionally portraits and quotes from famous astronauts are incorporated into the murals with information imparting key facts on the galaxy – everyone unique and different. 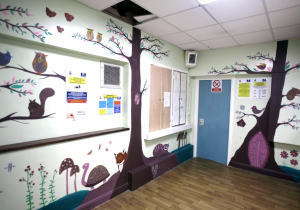 At the start of the visitor journey a “Magic forest” has been created featuring hidden animals, fairy doors and even the Cheshire cat from Alice in Wonderland with the aim of providing an engaging distraction to reduce the impact on children of the experience of visiting prison and going through the security scanners. On exit “Goodbye” is scripted in a variety of languages. The visitors journey is completed, having hopefully been enhanced by this long lasting legacy. Out for Good – now in its 2nd phase.. Following our successful pilot the second phase of our innovative, case management focused project that supports ex-offenders into employment is underway in HMP Brixton. 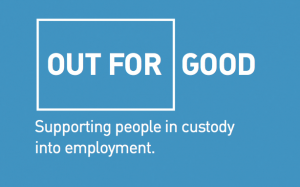 Funded by Sheriffs and Recorders and set up in memory of the late Treasurer of the Prison Reform Trust, Andrew Fleming-Williams, Out for Good brings together prisoners and employers within the prison environment, helping to prepare prisoners for jobs upon release. The project targets prisoners who are six months prior to release and are motivated and able to find work. 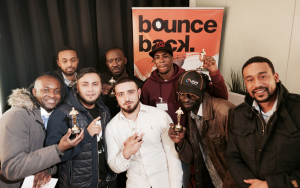 With tailored case management support from Bounce Back, and mentoring support from The Reasons Why Foundation, the men are able to realise their own potential and work towards achieving sustainable employment in an industry of their choice. By forming close and professional relationships with Case Managers, prisoners are guided to help them pursue work that they are most suited to and are most likely to succeed in. The unparalleled input from the employers who have not only come into the prison a number of times to meet prospective employees but have also offered a number of jobs and interviews to a number of participants make the project unique. This project is effective in that it provides real opportunities for ex-offenders and guides them through the process of recruitment. Working so closely with employers is vital, as businesses are able to visit the prison and see how many dedicated, experienced and enthusiastic individuals can be found there. 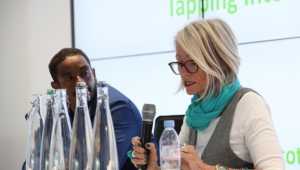 This is often a profound experience for employers and encourages them to think more seriously about expanding and improving their recruitment processes to ensure that ex-offenders have a fair chance. Initially, businesses come to the prison to talk about the work they have on offer and the vacancies available. When prisoners then register their interest in a given organisation, a one-to-one chat is arranged between the employer and prospective employee. Case managers are involved throughout to ensure all parties are on the same page and recognise what they stand to gain from the project. If employers get on well with a given participant, they often invite them for an interview or even straight to on-boarding upon release. This means that prisoners can have a job lined up and be completely work ready before they are released from the prison. Release from prison is daunting but when an individual can feel safe in knowledge that they have work lined up, this process is likely to be much easier. Recently, a participant who secured work during the pilot scheme attended a session in HMP Brixton. Brian met with a potential employer whilst serving time in Brixton and was subsequently offered a job upon release. 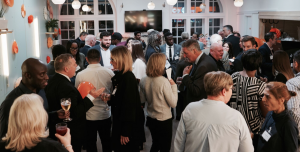 Upon returning to Brixton, he spoke to the current participants about why Out for Good is so effective at helping people find real and sustainable jobs, and why the support offered by Bounce Back is so invaluable in easing any issues that are encountered. Many participants are already reaping the benefits of the Out for Good model. Out of the participants who have already been released, several are already in work and a number have jobs in the pipeline, with on-boarding and induction sessions being arranged. For those still in prison meetings with employers are on-going. While there a number of projects that run in prisons with employability in mind, Out for Good is unique in that it brings together employers and prisoners before prisoners are released. In forming these relationships early on, all parties are able to work together to ensure that the process is kept as simple as possible and ex-offenders are supported into the work environment in the best possible way. Not only does this increase the chances of successful employment, but it helps to challenge many common misconceptions about the process of employing an ex-offender, highlighting how with the right support, ex-offenders can be welcomed into the workforce for the benefit of everyone. 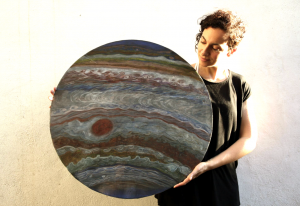 To celebrate their bicentenary the Royal Astronomical Society established an Outreach and Engagement Fund to support astronomy and geophysics projects for diverse sections of the community. 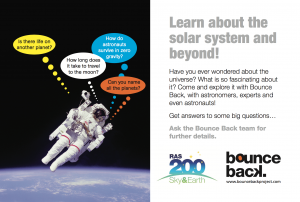 In May 2017 Bounce Back were announced a winner and we are now developing a project which aims to engage prisoners in astronomy and other STEM subjects. 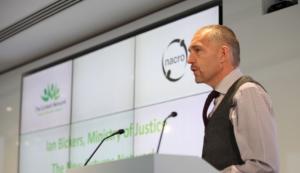 This gives us the opportunity to stimulate new ideas and approaches to prison education and demonstrates the diverse range of training and education initiatives that are on offer in prison to employers. It also shows how such opportunities offer individuals the chance to learn a variety of transferable and valuable skills. Although a slight departure from our everyday work in training prisoners in construction, it is an exciting and thought-provoking time for the us. The aim of the project is to stimulate interest in astronomy, whilst helping prisoners “See beyond the prison walls” and their current circumstances. Facilitating an environment that encourages prisoners to think about their place in the universe will help them re-evaluate their priorities and alter their mindset. Aspects of mindfulness will underpin the project activities, and participants will learn to think differently about life. Since May 2017 the project has been in a research and development phase as we reach out to other organisations and explore potential partnerships that will maximize the reach of the project with new audiences. We have also been working closely with a number of fellows from the Royal Astronomical Society who are excited to offer their expertise to teach prisoners about the solar system. The project was introduced to HMP Brixton, (chosen site for the pilot phase) at the end of last year. The responses from prisoners has been overwhelmingly positive and somewhat unexpectedly – many have prior knowledge of astronomy from documentaries featuring Professor Brian Cox and Tim Peake. Beyond Prison Walls is an innovative project that will offer us the opportunity to break boundaries in prison education. With the hope of using Virtual Reality headsets to allow prisoners to explore the universe, the project will provide prisoners with new and exciting opportunities that will advance their astronomical knowledge and could also inspire curiosity and stimulate new interest in learning. With a hint of Halloween our Annual Awards ceremony was held at the end of last month at Centrepoint’s Dean Street Cafe. Hosted by Tom Watt, guest enjoyed a humorous evening with delicious food presented by the trainees at the cafe. This year the awards were donated and presented by our Employers and Partners who personally acknowledged the achievements of 14 individuals who had excelled with them. But the event was not just an intimate celebration for the award winners. It was also an opportunity to thank and celebrate our very valued employers and supporters – the very people that provide the essential ingredient for changing perception, spreading the word and helping others to see the talent pool that exists so that we can all help to reduce re-offending and change lives together. Rash, who won the “Most Entrepreneurial Spirit” presented by Michael Smith of Brixton Bid. Rachel, one of our Crisis participants, won a special award. TFL awarded Jermaine the “Out for Good” award for his success with our new pilot programme supporting offenders into a wider variety of industries. Our funded pilot project, which was part of the Ministry of Justice’s Reform Prison programme, “Improving the prison environment” in HMP High Down was completed in September 2017. The project involved a number of inmates in the painting and decorating of various rooms including the homework room and listening room. The participants themselves were the designers of the redecoration in every respect and the process consisted of three intensive group planning sessions as well as personal in cell work. Participants chose the colours and concepts, putting forward ideas for special features such as the blackboard pillar in the Homework Club Room. This involvement created a sense of shared ownership and accountability to the prison community as a whole. 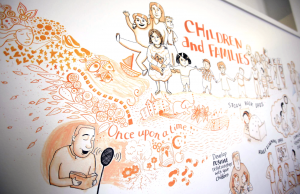 The results were highly effective and all of the rooms were further enhanced by the talented artist, Federica Ciotti whose amazing murals brought each room to life. 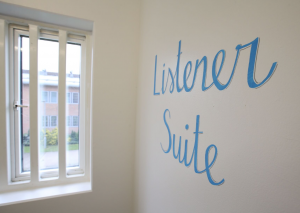 In addition to improving the atmosphere of the “Listening Room” – a private space where prisoners can “off load” to a trained fellow inmate “Listener”, the Homework Club Room was also completely transformed. 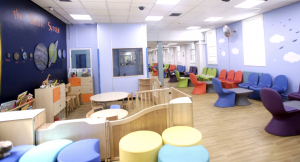 The purpose of the Homework Club redesign was to create a welcoming environment which would reduce the trauma of coming into a prison environment for visiting children and increase the quality of time spent with their father. The goal was to create an environment which was visually stimulating and interactive: an “oasis” in the prison complex which would meet the needs of all users. Featuring an exquisitely drawn “Evolution Wall” and an amazing “Interactive map of the world” the result was quite overwhelming. Following the success of our first Out for Good project in HMP Brixton, funded by Sheriffs and Recorders, we are about to embark upon our second programme. Having worked on the outcomes with the partner employers involved we are able to evaluate the learnings from the first project to adapt and develop the next one starting in October. 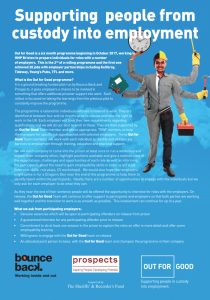 These 6 month programmes, run by Bounce Back and Prospects/NCS, give a variety of employers a chance to be involved with the recruitment of prisoners with the support of the dedicated Out for Good Team. Working with both participants and employers throughout the period and for up to a year beyond, an Out for Good team manager ensures the process through preparation and into work is managed throughout. To become involved prospective employers for the programme are invited into the prison to run a workshop and explain their company ethos, highlight positions available and give a realistic view of their expectations to the programme participants. The participants are individuals who are motivated to work and are between 4 and 6 months prior to release. Both sides are then supported with candidates being prepared for the job opportunities whilst allocated “champions” within the company liaise with the team. As they near the end of their sentence the programme participants interview for the roles with the employers and many are offered full time employment. Employers that engaged with the first programme included Tideway, Young’s Pubs, Keltbray, Alandale and Tfl and a total of 20 job offers were accepted. If you would like to find out more about our criteria and how to be involved with our Out for Good programme please contact us. 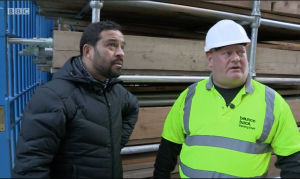 We were so pleased that Raphael Rowe was so inspired by our work that following his visit to open the scaffolding centre that he campaigned to run a feature on our training and employment on the BBC The One Show in early December. 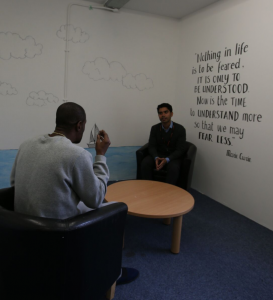 The comprehensive piece started in HMP Brixton interviewing our trainer and a trainee before visiting one of our recently qualified and released cohorts now out working full time on site with Alandale. It really told our story well and we hope raised awareness hugely of the importance of giving ex-offenders a chance. At an event attended by in excess of 100 people held at the Clink Restaurant our scaffolding centre was officially opened by Paul Elliott, eminent football governing body ambassador and passionate supporter of youth engagement, and hosted by TV presenter and journalist Raphael Rowe. The launch of our latest skills training centre is a very special for two reasons. 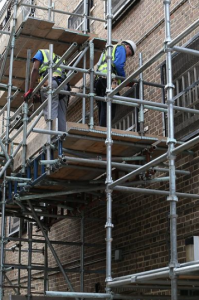 It is the first ever in a UK prison and secondly it is a clear example of a response from the construction industry to an immediate need for scaffolding recruits. Alandale, through its relationship with Land Securities came into the prison and set up the training facility for us so we could train up potential employees. What has also been hugely rewarding is the immediate response we have had from scaffolding companies around the UK who are keen to tap into the unique pool of trainees for a section of the industry that is crying out for workers. 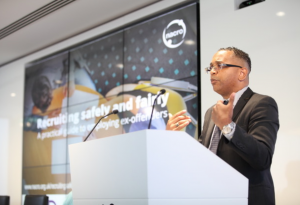 “Bounceback is an excellent example of how employers can provide invaluable work opportunities for offenders while in prison to help them turn their lives around. In addition we continue to ensure that the trainees have also gained their CSCS cards whilst still in the prison environment so they are ready to work as soon as they are released – something that is fundamental to preventing people re-offending when they leave prison. The employers and companies we work with have been resolute in their support, as have NOMS, NOVUS and the prison. The industry values the fact that not only does the organisation provide training, but they work with the individuals ‘through the gate’ as well as with employers on an ongoing basis to ensure both sides are working well together. As Keltbray said when they started working in the sector ‘we genuinely couldn’t have done it without them’. Equally, we couldn’t do it without the support of the construction companies, it is an ideal model to take forward.